Malala Yousafzai attends a ceremony with United Nations Secretary-General Antonio Guterres after being selected a United Nations messenger of peace in New York, New York, April 10, 2017. Nobel Laureate Malala Yousafzai has been named as a U.N. Messenger of Peace with a special focus on girls' education. During a ceremony at U.N. headquarters Monday, and streamed live on Facebook and YouTube, U.N. Secretary-General Antonio Guterres welcomed the 19-year-old, saying, "I am a frustrated ex-physics professor … facing the most famous student in the world. You are not only a hero, but you are a very committed and generous person." He read from the designation on the framed certificate that he presented to the young activist, citing her dedicated service to the ideals and objectives of the United Nations — especially its vision of a life of dignity for all people. Guterres also cited Yousafzai's "courageous defense" of the rights of all people, including women and girls, to education and equality, and honored her for showing "an unwavering dedication to peace" even in the face of great danger, and her desire to foster a better world. Yousafzai is the youngest-ever Nobel Peace Prize laureate, receiving that international accolade in 2014 when she was 17 years old. She is now the youngest U.N. Messenger of Peace. FILE - Malala Yousafza, speaks to refugees in the Dadaab refugee camp, Kenya, July 12, 2016. Yousafzai became an advocate for girls' education when she was 11 years old and living under Taliban rule in Pakistan's Swat Valley. There she began to blog anonymously for the BBC's Urdu language site, campaigning for the right of girls to an education. "Education is the right of every child and, especially for girls, this right should not be neglected," Yousafzai told a packed room of diplomats and young girls Monday. "If we want to go forward, we have to give education to girls. And, once you educate girls, you change the whole community, the whole society." The role of men in effecting change in society is crucial, she said, paying tribute to her father as one who always encouraged her. "What is different in my story is that my father did not stop me," she said. "It wasn't that I was very intelligent or very clever or I had some special kind of training or something. All I had was a father and a family who said, 'Yes, you can speak out, it's your choice.'" Yousafzai's advocacy brought retaliation from the Taliban, which preferred to see women and girls oppressed. On Oct. 9, 2012, Yousafzai, then 15, was attacked and shot in the head while on the school bus. Yousafzai was airlifted to a Pakistani military hospital in Peshawar, and four days later to an intensive care unit in Birmingham, England. "I realized that extremists tried all their best to stop me; they tried to kill me and they didn't succeed," she said. "And it is a clear evidence that no one can stop me. This means that now this a new life, a second life, and it is for the purpose of education." FILE - Malala Yousafzai holds flowers after speaking during a media conference at the Library of Birmingham, in Birmingham, England, Oct. 10, 2014, after she was named as winner of The Nobel Peace Prize. Yousafzai lives in Britain with her parents and younger brother. There, she has become an international advocate for girls' education through the Malala Fund, which she runs with her father, Ziauddin. The fund promotes 12 years of free, safe and quality education for girls worldwide. She has visited the families of the Chibok girls in Nigeria, worked with Syrian refugees — opening two schools for them in Lebanon — and has invested in education for girls in her native Pakistan. According to U.N. statistics, more than 130 million girls do not go to school. Many are forced to marry early or must work or care for younger siblings, denying them their right to education. Yousafzai joins the ranks of other U.N. Messengers of Peace, including actors Michael Douglas (disarmament) and Leonardo DiCaprio (climate change), and musician Stevie Wonder (persons with disabilities). 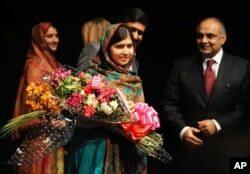 In Yousafzai's hometown of Swat, people hailed her new U.N. title. Mohammad Khan, a prominent human rights activist and lawyer based in Swat, said he was pleased that the international community has appreciated Yousafzai's efforts and the ordeal she has gone through for the sake of women's rights and education. "The sacrifice she has given for humanity, it has no precedent in [the] contemporary world," Khan told VOA's Deewa service. Yousafzai's school teacher, Ahmed Shah, said he was proud of Yousafzai for being designated as the U.N. peace messenger. "It is a matter of great pride and prestige for us that Malala Yousafzai has brought these honors for our homeland," he told Deewa. VOA's Deewa Service contributed to this report.